Acute rheumatic fever is a multi system disease. Occur as a result of reaction to infection with group A streptococci. Almost all the manifestations of rheumatic fever resolve completely except cardiac valvular damage. This is mainly a disease of children aged 5 - 14 years. Females are more commonly affected. Later the leaf thickening, scarring and calcification result in valvular stenosis. ECG will show evidence of ST or T wave changes. P-R interval prolongation. Knee, ankle, hip, and elbow are most commonly involved - asymmetric joint involvement is seen.. Acute painful inflammation of joint produce pain in rheumatic fever. Typical joint involvent is migratory, moving from one joint to another over a period of hours. Joint pain is severe and usually disabling. 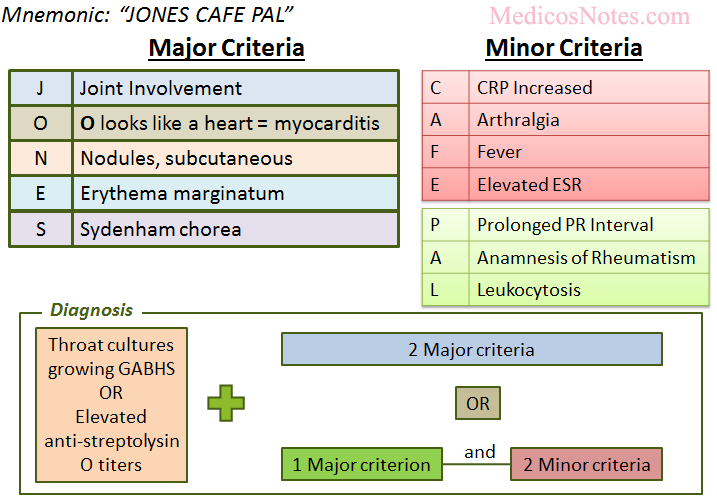 If the joint involvement persists more than 1 or 2 days after starting salicylates it is unlikely to be due to acute rheumatic fever. Most of the time sore throat is seen 2-4 weeks prior to the onset of joint symptoms. Joint involvement is more prominent in adults and carditis in children. Manifest late after initial infection with streptococcus(6 months or so). Sidenham chorea manifest as spasmodic unintentional movements & possibly altered speech. Spontaneous recovery is seen within 6 weeks. They are red macules which fade in the centre, but remain red in the periphery.Never seen on the face. Painless, small (0.5-2 cm), mobile lumps seen beneath the skin overlying the bony prominences, particularly of the hands, feet, elbows and occiput. Usually seen 2-3 weeks after the onset of disease. 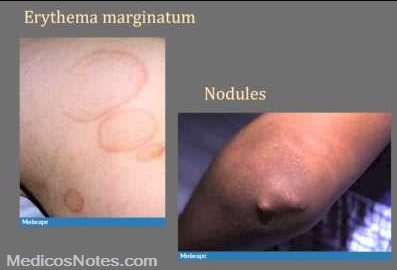 Significance of subcutaneous nodule is that if they are present associated carditis will be there. High-grade fever (39°C) is the rule. C-reactive protein (CRP) is elevated..
Lleucocytosis,raised ESR, raised C reactive protein. Throat swab culture: group A streptococcus.